I made this masthead for my friend Roxwriting. This started out as a joke on the weekend that both of us had nothing to do and we were making fun of her blog title. Staring at it makes me want to eat it. 1. 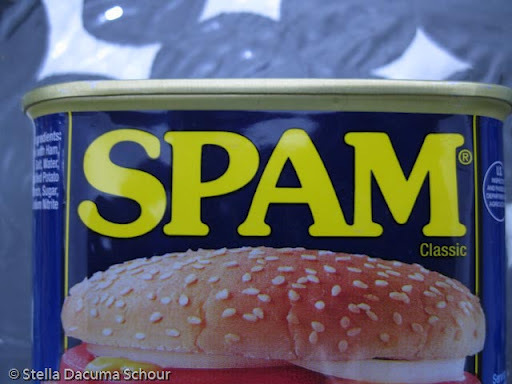 Take a photo of Spam Can. Make sure it is not tilted in any way. 2. 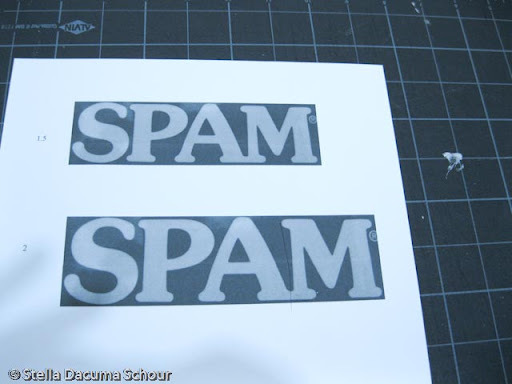 Template – Print out a 1.5 inch and 2 inch spam logo on cardboard stock. Make sure this is manageable for you to cut, and will fit in your printer. Printing on paper is fine too but you need it to not bend or disintegrate. 3. 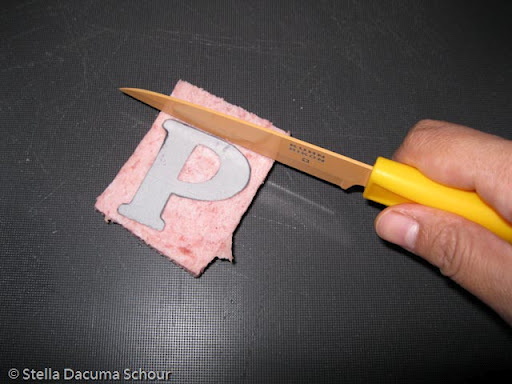 Slice your Spam in about quarter inch thick, Taller than 2inches and a bit wider than 2 inches. The letter M is wide. FREEZE for about an hour or more. 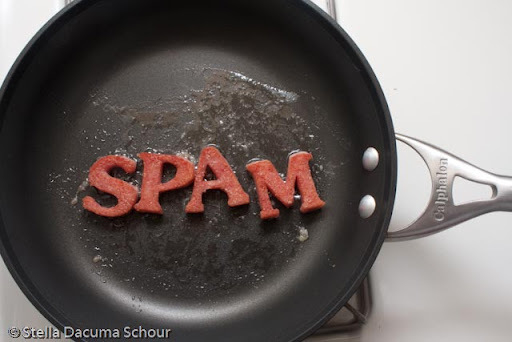 You need the Spam to be a bit firmer. 5. Take out your Spam from the freezer. You don’t need it to be frozen as it will be hard to carve. Place your template over the spam for a proper fit. 6. Start carving. 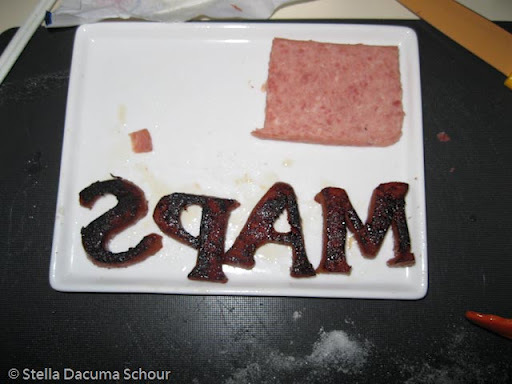 I carved most of the Spam using an X-acto knife. This paring knife looks good in the photo but is not a good carving tool. 7. Heat up your frying pan. I use a Calphalon Hard Anodized Nonstick pan. This pan distributes heat evenly. Melt a bit of butter and some olive oil.Fry the right side first. Cook it carefully in the lowest possible heat setting. After a minute or two, take it out, and coat it with a bit of sugar. This will give it a caramel brown color. 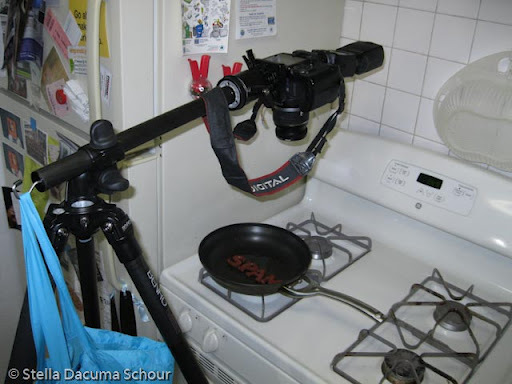 Once it is done on the right side, take it out of the pan so you can set your camera. 8. This is what my camera set up looks like. Im using a Benro Flexpod C297EX. My wonderful tripod “bends” to a 90-degree angle. Inside that turquoise bag is a heavy saucepan, it keeps my camera from falling into the frying pan. 9. 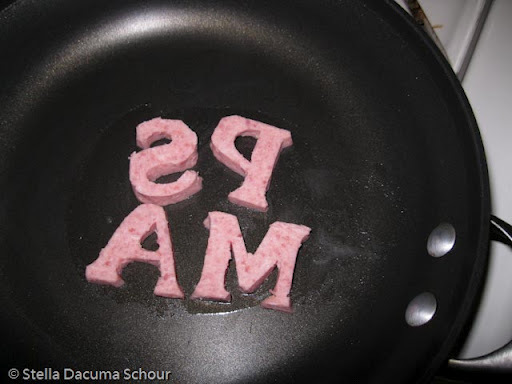 Heat the frying pan again, and fry the Spam right side up. If you don’t have enough frying bubbling action, add some butter or olive oil. Butter makes those slow moving frying bubbles, and the olive oil will keep it from burning. 10. Take all the pictures you want until you get that perfect bubble inside and outside the letters! This is what the bottom of my letters looked like after I was done. It looks burned and it was just starting to burn, so I tasted it after taking this photo. It tasted good, so I had it for dinner. MMMmmm. 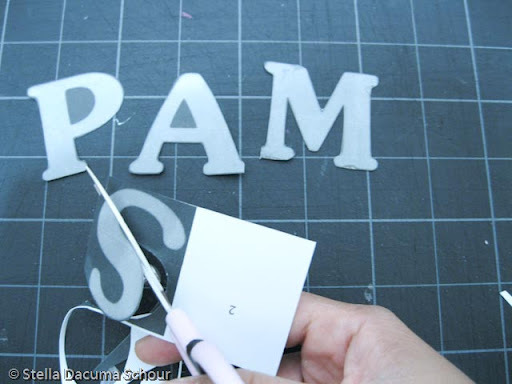 Spam! 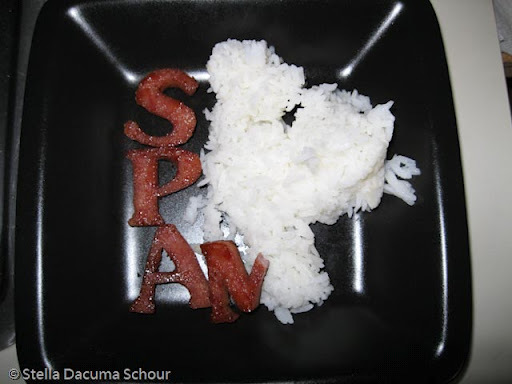 ***I have been eating Spam since childhood as this is a special treat in the Philippines. 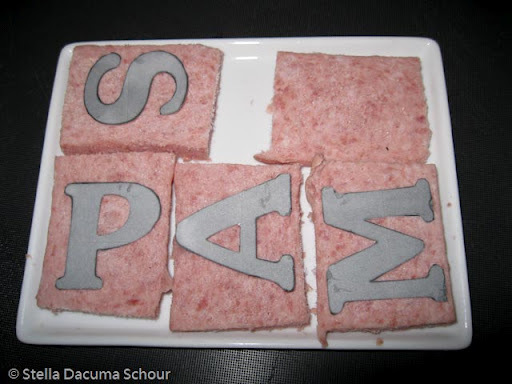 I still love eating it from time to time and yes, SPAM IS BETTER FRIED (and eaten with rice and egg). ***** I did say “special treat.” Spam is not cheap in the Philippines. 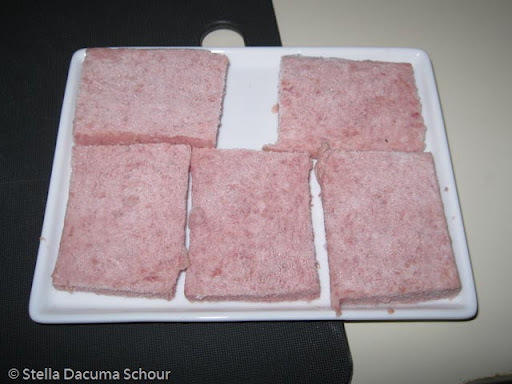 So we sometimes eat substitutes like Ma Ling and whatever luncheon meat form we find. We love them all the same. Spam is kind of not cheap in general. I get it at the dollar store. Why is it so tasty? It's probably the awesome combination of salt and porkfat.